Sprout some new ideas for your edible garden in January! 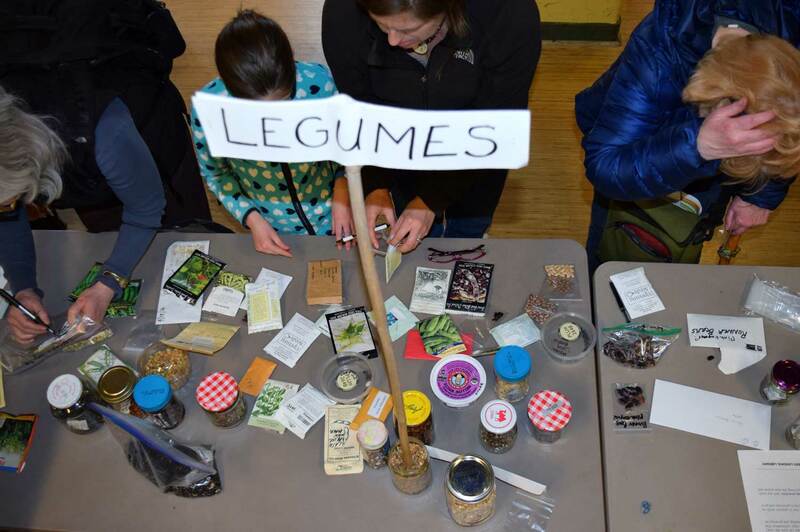 Come to the annual Seed Swaps presented by our King County Seed Lending Library branches. Along with seeds of favorite vegetables, you will find enthusiastic fellow gardeners to share their best varieties. Many attendees at last year’s swap brought their own seeds. At the swap, stick around to learn about both ends of the gardening year. There will be short workshops on seed starting and seed saving. If you save your own, you can make a deposit to the library’s seed bank at next year’s swap. If donating packaged seed, it should be organic or open-pollinated or heirloom. 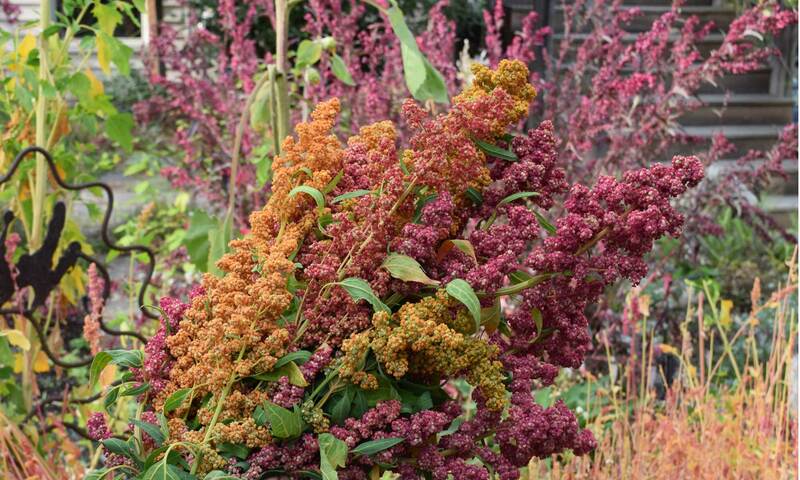 If donating home-saved seed, please clean it off the stems or stalks and bring only the seed. You can clean your seed at the swap. We will have screens and buckets available. Please label all donations with seed type, variety if known, and year it was grown/saved. The Seed Swaps are free and open to all; bringing seed is not required. The King County Seed Lending Library has five locations around the county, all operated by volunteers and supported solely by donations. Are you saving seed from a crop you loved? Share it with us at our annual Seed Homecoming on Friday, October 6! Seed of Rainbow Chard being winnowed. Perhaps you grew out a plant from a variety you got at our Seed Swap in January, or just have lots of leftover seed from your gardening purchases this year. You can share seed and help others grow a garden by bringing your extra supply to our table at the Phinney Farmers Market in Northwest Seattle. The King County Seed Lending Library will be accepting seed from 4 to 7 p.m.
Our Seed Homecoming marks the end of the traditional growing season, when gardeners are getting ready to put their gardens to bed. 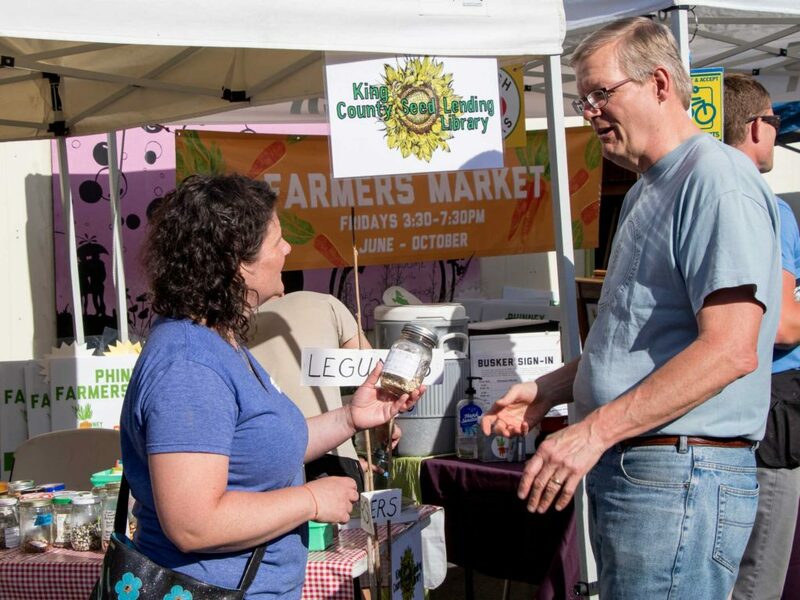 KCSLL Coordinator Bill Thorness shares seeds with a farmers market attendee. Photo by Lee Harper. Saving seed is a vital step in keeping alive our most-beloved or possibly rare varieties of edible plants. In a marketplace ruled by popularity, where only the best-selling varieties are propogated, the future diversity of our gardens may depend on our tenacity in keeping alive a wide selection of cultivars. The King County Seed Lending Library, now with five branches, has the capacity to store and distribute a lot of seed, but we focus on particular types of seed. Please donate only seeds of edible plants that your fellow gardeners would grow from seed, such as annual vegetables, herbs and edible flowers. If donating packaged seed, it should be organic or open-pollinated, plant types that will produce seed true to the stated variety. If you can’t clean it in advance, plan to spend some time cleaning it at our booth. We will have screens and buckets available. All donated seed should be fresh, within three years of purchase or saving. Bonus: This year, thanks to a donation from our friends at the Seattle Farm Co-op, we will be giving away a small amount of mixed cover crop seed to anyone who brings seed for donation (or to anyone who stops at the booth, if we have enough to share). This is the perfect time to plant a cover crop to help enrich your soil on empty garden beds over the winter.